‘Ayurveda’ is the oldest traditional healing system practiced in India and the most comprehensive holistic healing system in the world. This ancient knowledge was given to mankind more than 5000 years ago by sages and seers for the well being of humans. It is also known as the mother of all healing systems. 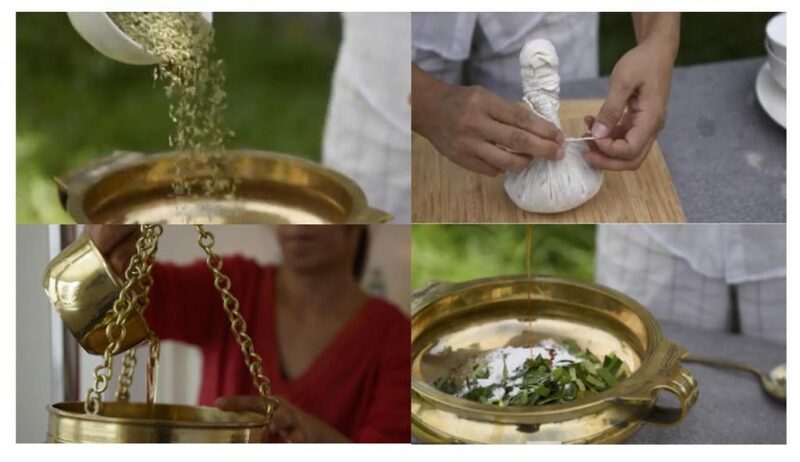 The sanskrit term ‘Ayurveda’ is composed of two words – Ayus + veda, Ayus means life and Veda means knowledge. So the literal meaning of Ayurveda is science/knowledge of life. Credit: Asako’s Ayurveda treatment by Yenny Yogini Videographer on Vimeo. Ayurvedic Massage treats the whole body through touch: physically, mentally and emotionally. Ayurvedic massage uses essential oils and its massage techniques include tapping, kneading and squeezing, as well as the more traditional massage strokes. The style and flow of the massage is determined by who you are, and what your body needs for balance and wellbeing at the time. Ayurvedic Massage is also known as Abhyanga. The principle underlying the method is essentially one of detoxification procedures. Application of warm oil and massage to the body promotes better circulation. It removes metabolic waste, reduces pain and swelling, improves complexion and texture of the skin. At the end of the treatment, you will receive an amazing face and head massage which takes you into a final deeper relaxation state. Availability: Wednesday, 9am to 3pm. Please contact us at 03 95989313 to make a booking. Payments are required when bookings are made over the phone.